You'll receive this quest from Kolsc, either in Esternwood near the eastern exit, or in Gilded Vale after completing the quest A Mother's Plea or the quest The Smith's Shipment. Kolsc will tell you that he's been organizing men against Lord Raedric, but that so far he hasn't had any success breaching Raedric's Hold. He'll then ask you to deal with Raedric, and he'll give you some helpful hints: he'll tell you that you should be able to sneak into the hold via the Dungeons, and he'll tell you that Nedmar inside the Sanctuary might be willing to assist you. You can just charge right in, guns blazing. If you've already explored multiple levels of the Endless Paths, then the defenders in the hold shouldn't pose much of a problem, which means you should be able to just fight them as you come to them. This is the quickest way to resolve the quest, as you can just enter the Main Keep through the front entrance (Exit C) and then head straight for Lord Raedric (#3). You can take Kolsc's advice and work with Nedmar. 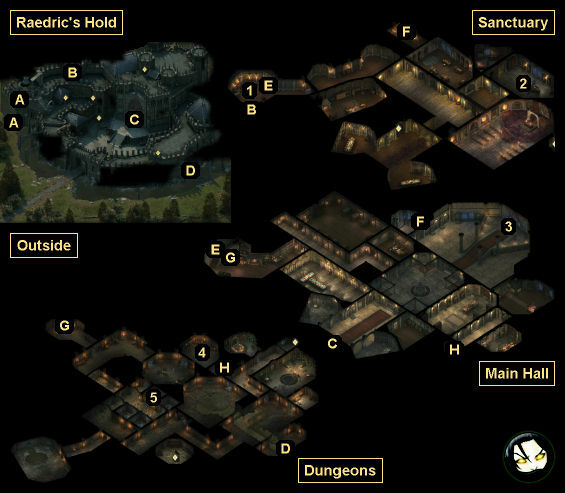 You'll find Nedmar in the Sanctuary (#2). To get to him without fighting, you can climb the vines of the bell tower (Exit A), enter the Sanctuary from the ramparts (Exit B), have one of your characters wear the Berathian Priest Robes found in the storage room (#1), and then walk over to Nedmar. You'll probably get challenged once or twice along the way, but Resolve 14 or Intellect 12 should see you through. When you reach Nedmar, he'll offer to help you, provided that you rescue his acolyte Giacco from the Dungeons. You'll find Giacco in a cell (#5), and you'll have to fight some undead creatures, including guls and revenants, to reach him. Giacco's cell will be locked. If you can't pick it open, then you'll need to defeat Osrya (#4) so you can grab her Rusted Iron Cell Key. When you free Giacco, he'll tell you about a carving that Nedmar gave him. When you return to Nedmar and tell him about the carving, he'll give you two Scrolls of Protection and a Burnished Steel Key. The key will unlock the way to a staircase (Exit F) leading to Lord Raedric and the throne room (#3). It will also unlock some of the doors in the Main Hall. Finally, Nedmar will allow you to rest in his room, and it won't cost you any Camping Supplies. Better yet, as of version 1.05, resting with Nedmar won't cancel any existing resting bonuses. You can work with the animancer Osrya in the Dungeons (#4). She'll tell you that Nedmar has been interfering with her plans, and she'll ask you to kill him. To reach Nedmar (#2), you should use the staircase on the western side of the Dungeons (Exit G), and then take the staircase in the kitchen up to the Sanctuary (Exit E). In the Sanctuary you'll find some Berathian Priest Robes (#1). If one of your characters wears them, then you'll be able to walk over to Nedmar. You'll probably get challenged once or twice along the way, but Resolve 14 or Intellect 12 should see you through. Nedmar will be all alone in his room, so he shouldn't be too tough to kill. However, if you trigger the fight using the "attack" dialogue option, then he'll call for help, and all of the guards in the Sanctuary will turn hostile. To prevent this, just complete a conversation with Nedmar, and afterwards force-attack him. Then the guards won't notice. When you return to Osrya, she'll open a secret door leading to a staircase (Exit H). The staircase will take you to the Main Hall, where you'll have an easy path to the throne room (#3). Osrya will also allow you to rest in her room, and it won't cost you any Camping Supplies. Better yet, as of version 1.05, resting with Osrya won't cancel any existing resting bonuses. You can attack Raedric. Fighting at the top of the steps leading to throne isn't a great idea, as you'll start out almost surrounded. So if you need to, you should retreat back to a convenient doorway and fight from there instead. Raedric will have several bodyguards with him, including tough champions and paladins, and so you'll just need to survive at the start. Make sure you keep your tank alive, and try to pick off easier targets, like the archmage and archer, first, and then whittle away at the others. When the battle is over, you'll find the unique great sword Justice on Raedric's corpse. Then Kolsc will show up to take command, and you'll earn an "extraordinary" reputation bonus with Gilded Vale. Note: If you complete the quest this way, then in Act III you'll receive the quest The Champion of Berath, where you'll get to fight Raedric again. You can attack Kolsc. You'll find him hiding in the ruined house in Magran's Fork. He'll have several bodyguards with him, including Giacco if you rescued him from the Dungeons (#5). You won't be able to maneuver inside the house, so just try to take out the priestess and the wizard first, and manage the rest as best you can. Kolsc's followers aren't as tough as Raedric's, so this battle should be by far the easier of the two. Defeating Kolsc and his men will cost you "major" reputation with Gilded Vale, but Kolsc will drop a Fine Sabre and more when he dies. Then when you return to Lord Raedric, he'll reward you with the unique great sword Justice plus 500 cp. You'll also earn a "major" reputation bonus with Defiance Bay. If you feel murderous, then instead you can attack Raedric rather than accept his thanks, and you'll earn the same reward as if you had sided with Kolsc. Vines. You'll be able to use these vines to climb up to and down from the hold's upper ramparts. Doorway between the upper ramparts and the Sanctuary. Entrance to the Dungeons. You'll need a Prybar or a character with Might 18 to use this entrance. Stairway between the Sanctuary and the Main Hall. Stairway between the Main Hall and the Dungeons.